Homemade berry popsicles are a great treat for those hot summer days. You'll get the flavor of all 3 delicious layers together or on their own. We love these Berry Creamy Popsicles. Once you try our favorite Red White & Blue Popsicle recipe, you’ll wish you made a double batch. Get those popsicle molds ready, folks! 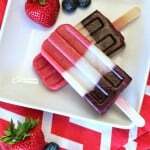 Just in time for the 4th of July, I’m sharing these dairy free creamy berry popsicles. Those red, white and blue stripes sure look tasty (I can promise you, they are!). Made from fresh strawberries, fresh blueberries and creamy coconut milk, these patriotic pops are low in sugar and so refreshing. Homemade berry popsicles are a great treat for those hot summer days. There is a little patience needed with this recipe, as you wait for the different layers to set. I love that you get the flavor of all 3 layers, together or on their own. My favorite is the hint of vanilla in the coconut layer. Creamy dreamy. 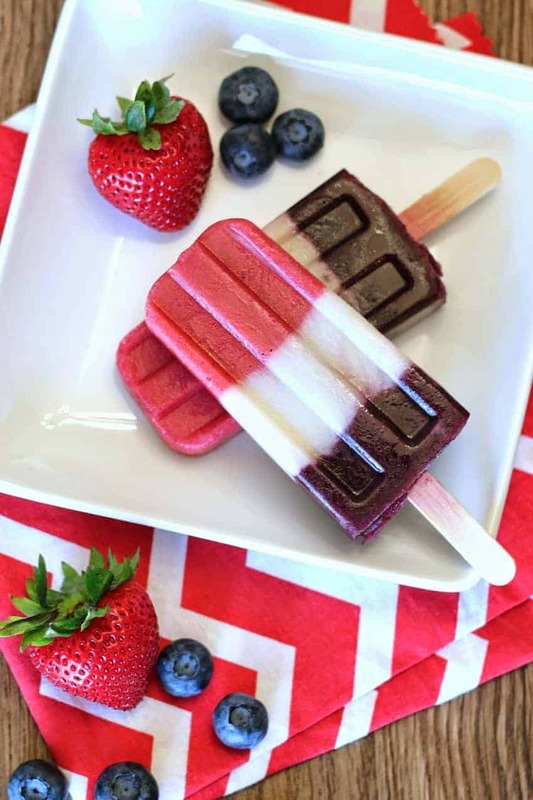 Say “God Bless America!” with these berrylicious popsicles this 4th of July! To make strawberry layer, place strawberries, coconut milk and maple syrup (to taste) in blender. Blend on high until smooth, 1-2 minutes. Pour into popsicle molds, filling 1/3 full. Place in freezer for 20-30 minutes or until slightly firm. To make coconut layer, stir together coconut milk, maple syrup and vanilla. Pour into molds, over top of strawberry layer, filling 2/3 full. Insert popsicle sticks and place back in freezer for another 20 minutes, until slightly firm. To make blueberry layer, place blueberries, coconut milk and maple syrup in blender. Blend on high until smooth, 1-2 minutes. Pour over top of coconut layer, filling to top of popsicle mold. Place back in freezer to allow popsicles to completely set, 1-2 hours or overnight. To remove popsicles from mold, run under warm water for 10-15 seconds. Release popsicles from mold and enjoy! *If you can’t find So Delicious culinary milk, simply use canned lite coconut milk. This entry was posted in Dairy Free, Desserts, Kid Zone, Recipes, Recipes & Techniques by Cooks We Love, Summer Treats and tagged 4th of july, america, autism diet, autism gluten free, autoimmune disease, blue, celiac, celiac disease, celiac health, food allergies, g-free, g-free diet, gluten allergy, gluten free, gluten free 4th of july, gluten free baking, gluten free cooking, gluten free diet, gluten free food, gluten free holiday, gluten free holidays, july, patriot, patriotic, red, USA, white, white and blue. Bookmark the permalink.